Sunday was a beautiful day so we loaded up our bikes and drove to Milwaukee to ride the bike trail along the lake front. Finding lunch on our bike rides is always an adventure. We rode to a the Historic Third Ward Warehouse District. The Third Ward used to be really run down but now it's full of restaurants, unique shops, theaters, galleries and condos. As we rode our bikes down the streets we saw this restaurant that was packed with people. That is always a good sign. There was a 45 minute wait for the roof top seating but we didn't mind. Well, it was worth the wait! I ordered the portobello benedict (roasted portobellos, sauteed spinach, grilled tomatoes, poached eggs, and hollandaise) It was the BEST eggs benedict that I have ever had. My husband, Kevin, ordered their specialty “lowland”- style crepe; loaded with toppings this unique item is called Pannenkoeken. It had asparagus, fried eggs, pancetta, parmesan, Belgian beer cheese sauce. Kevin like it very much. I had a bite and it was delicious but it was huge. He ended up leaving a lot of the crepe but ate all the topping. The drinks we had were beer mosas, (fresh squeezed orange juice and beer). Never thought of mixing OJ and beer but it works. Great drinks with our brunch! You might be thinking how do they get on their bikes after eating all that food! Well, we did ride a little slower but it was so worth it! 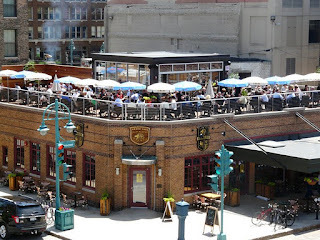 If you are ever in Milwaukee, WI check out Cafe Benelux.